Tales from a tribble: What's In A Hero? In the after game interview T.J. Oshie had with a reporter, he was asked how he felt to be a hero. T.J. Oshie gave this stirring patriotic response: "The American heroes are the ones wearing "camo". That's not me." Wow, do I agree with T.J. Oshie. No he is not a hero for being a hockey player; he is not a hero for being on the USA Olympic Hockey team; he is not a hero for scoring the game winning goal in the important match against Russia in the Olympics. No, those things make him a great clutch hockey star who has made America proud, not a hero. But, when Oshie had the stage all to himself and turned it over to recognize the real heroes, the men and women in our military who have fought and are fighting for our national security and to keep us free, that is when T.J. Oshie became a hero in my eyes. No matter what happens in the rest of these games or whatever Oshie does in his NHL hockey career, his recognition of the heroic military men and women thus taking the spotlight off himself will always make T.J. Oshie an American hero. 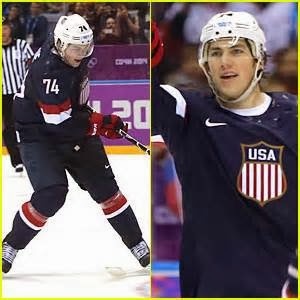 T.J. Oshie is a great hockey player and an even better American patriot!